If you were at Rogers Centre for the games this weekend you would have been part of a crowd who witnessed some dynamite baseball from the Jays who are now 23-16, this season. After a great (7-3) road trip, the Jays swept the Texas Rangers in a three-game series which began Friday night to an excited crowd and pleasing weather. It is some of the young players on the team that have been a factor in the recent success the team has been seeing. As the team has gotten younger, so have the fans taking in the games. Parents, who bring their children out to the stadium, have the opportunity to give their children an experience that they’ll remember as they grow older. At My Best Jr. Jays Saturday are a good example of that, when you can observe well over six-hundred kids run the bases post-game. It is these experiences that will last a lifetime with those kids. I have memories of going to baseball games with my papa at a young age – glove in hand and eager to catch a glimpse of a baseball game with players who seemed eight-feet-tall. Now, I did that in the early-to-mid 90’s and with technology and various things tugging for a child’s attention from every direction it’s harder to grab their focus these days. If they love baseball, fostering their fandom of the Toronto Blue Jays and the sport will only encourage a fondness for a team that is changing. As the team is building and growing to become a key competitor in the AL East Division, the future looks bright. Any fan can attest to their love for a sports team from a young age, and these young fans will be supporters of the team as they grow and the Blue Jays flourish into something greater. This season, the Toronto Blue Jays re-launched their Kids Club as the Jr. Jays Club, which is pretty neat, if I do so say myself. Kids ages 4-14 can become Official Club Members by simply purchasing a Jr. Jays Club kit and activating their membership. 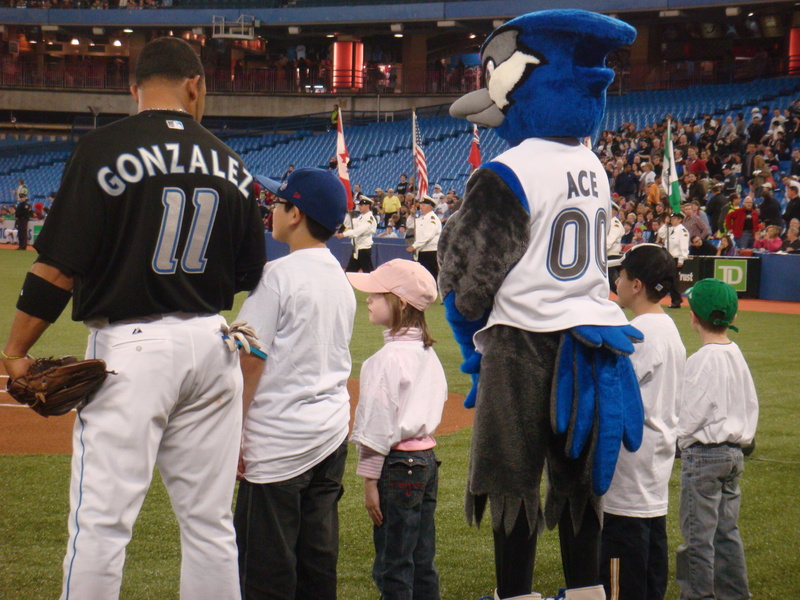 Not only does the child receive the initial kit (with Blue Jays bits and pieces, like foam fingers and Webkinz) but they also get the chance to participate in unique opportunities like exclusive Autograph Sessions and visits to Blue Jays Batting Practice before games. In addition, there is a special event for Jr. Jays Club Members called ACE in ACTION where they will have an opportunity to go right down to the field and run around with select members of the Toronto Blue Jays. 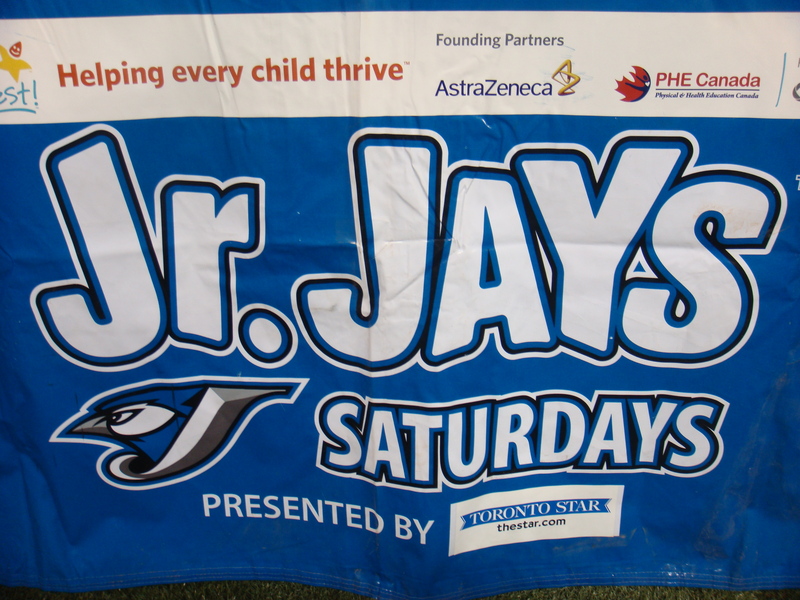 The Blue Jays encourage children to stay healthy and fit and with this event, athletes who work hard to stay physically fit will lead by example for young fans. If you have a child or know of one, this Club allows young fans to get a one of a kind look at a team (up close at autograph sessions and batting practice) and to be part of a crowd while spending time with their families at the stadium. 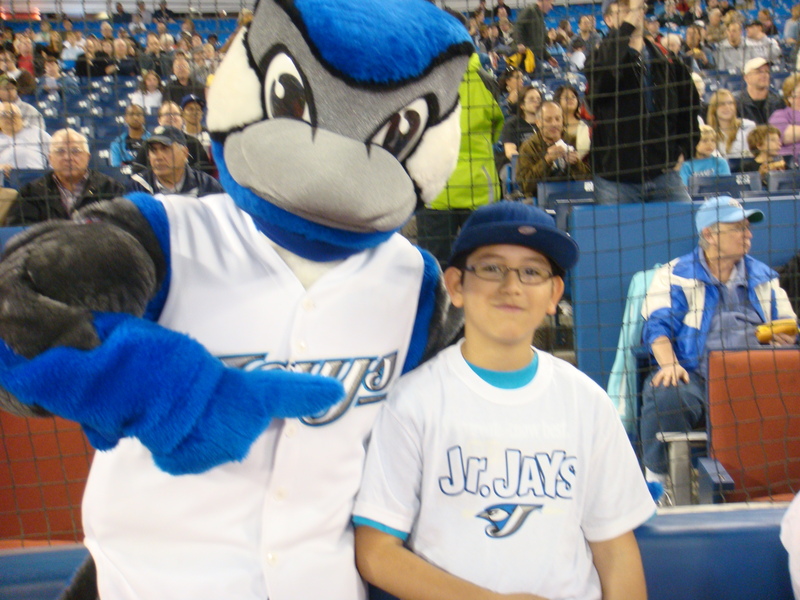 Jr. Jays are also encouraged to participate in At My Best Jr. Jays Saturday, which is open to all kids every Saturday home game at Rogers Centre. 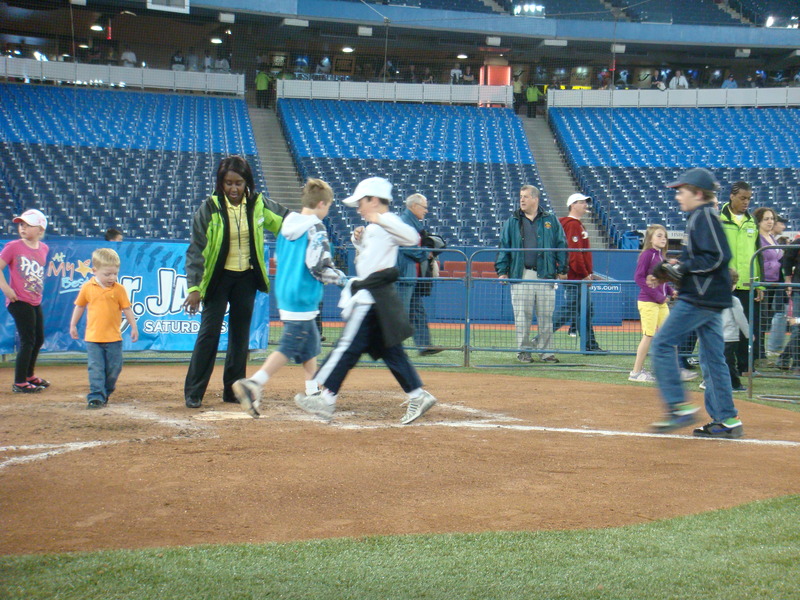 Kids are chosen to be part of the starting lineup and in game announcing and every child has the chance to run the bases post-game. As the season progresses, At My Best Jr. Jays Saturdays will take part outside of Rogers Centre and will be an interactive experience for young kids before the game. I’ll be blogging about the At My Best Jr. Jays Saturday outdoor program experience which begins May 29th, 2010 at 11:00am outside Gate 10 of Rogers Centre. In the meantime, check out the website to discover what else the Blue Jays do for young fans throughout the season. To purchase a Jr. Jays Club kit or for more information on the opportunities for young Jays fans, visit http://www.bluejays.com/kids. Since Jackie Robinson Day Thursday and a tough weekend against the Angels, quite a bit has happened in and around the Blue Jays club. A new edition to the team and trends setting in early on in the season, a response from Blue Jays President Paul Beeston to an article published in Chicago about baseball in Toronto, and the first Jr. Jays Saturday (a chance for young fans to take part in game day activities). Since it’s Monday, let me catch you up to speed. The Outfielder made his MLB debut in 2006 in San Francisco and played in 326 games for the Giants. In his three seasons in San Francisco he made 931 plate appearances holding a batting average of .277 with 53 doubles, 16 triples, 16 home runs and recorded 34 stolen bases. Lewis was placed on the Disabled List earlier in the month for a strained oblique muscle and rehabilitated in the Pacific Coast League. Upon reactivation last Thursday April 15th he was traded to Toronto in return for Future Considerations to the Giants. The trade was made official late Thursday night by the Toronto Blue Jays. After a day of traveling back to Mississippi before flying to Toronto Friday, Manager Cito Gaston chose to leave Lewis out of the lineup Friday. Saturday, Lewis did make a plate appearance at the bottom of the ninth, pinch-hitting for Catcher Jose Molina. Unfortunately he was unsuccessful; Lewis struck out swinging against Angels RHP Fernando Rodney in his plate debut for the Jays, Saturday. However, Lewis started in left-field and batted first Sunday in the final game of the three-game series against the Angels. Lewis rectified first impressions when he doubled in the 3rd and promptly stole third base, marking the 35th time in his career he has successfully stolen a base. Though no run was scored and his other three at-bats were not as victorious for the Jays, the 3rd inning was a glimpse of Lewis’ potential. No doubt it’s tough to up and move but he’s excited to go to bat for the Jays as often as possible. After the Jays were swept by the Angels over the weekend, despite a notable appearance from Ricky Romero on the mound Sunday, the Jays are looking to come back against the Royals who are in Toronto for a three-game series beginning tonight. Obviously, the signing of Fred Lewis will not be a key factor in the turnaround, but rather it will be a team effort and could aid the momentum to break the offensive trends that have been surfacing early on in the season. Twitter had never seen such an outcry from angry Blue Jay fans over the past weekend, after an article was published in a Chicago newspaper stating that due to a multitude of factors (according to this particular writer) including poor attendance after the Home Opener in Toronto, that the MLB did not belong in Toronto or in Canada for that matter. Game attendance decreases naturally after the Home Opener which makes sense, but this writer had a lot more than just attendance to comment about. Confused fans on Twitter took to their updates to express their feelings on the aforementioned article though the fire died down after about a day of responses and angry comments on the article, which by then, Toronto papers had picked up on and summarized for the city to see. Blue Jays President Paul Beeston commented on the article and the thoughts of the writer Saturday, which promptly halted the discussion, “The Blue Jays will be in Toronto longer than the writer will work for his paper.” That was the end of that. If you haven’t been out to a game yet, you should really go – there’s nothing quite like live baseball on a Saturday afternoon and here’s a fun fact: The roof on Rogers Centre was open last Thursday night (April 15th, 2010), which set a new record for the earliest date the roof has ever been open. The previous date was April 16th, 2002. You know what that means? Spring is in the air, the Jays are 13 games into their season, and summer baseball is soon to be thriving. I tried to recall what it was like going to baseball games as a kid and only vaguely remembered a few visits to Rogers Centre (then SkyDome). This past Saturday marked the first Saturday in which kids had the opportunity to participate in aspects of the game including the starting lineup and the in-game announcer. If I could tell you how many times I said “Awww” in regards to one of the kids – that would be remarkable – because unfortunately it happened so often that I quickly lost count. Kids aged five to ten were selected randomly prior to the game Saturday and given a spot in the starting lineup, where they had the chance to run on the field alongside a Jays player in the starting lineup. I don’t think I’ve ever met smarter kids who told me about why they didn’t like certain players no longer with the team and how they got traded, how many home runs Vernon Wells has hit or when Aaron Hill will be back. It’s remarkable to speak to kids who are so knowledgeable because I often forget how much information they can retain, like I did at their age. I quickly made friends with Jarrett, 6, and Crystal, 5, who were both jumping up and down with excitement over the chance to simply run on the field. It doesn’t seem like a big deal to some, but to them, it was huge. I captured some of the best moments of the afternoon, so take a peek at the pictures below but watch the video of the starting lineup [click here]. I promise, it will make you smile.